American Street by Ibi Zoboi received so many rave reviews last year - and was a finalist for the National Book Award for YA literature - that I couldn't wait to read it, so I was thrilled to get the audiobook for review. I was completely immersed in this captivating novel that combines an immigrant story with the dark underbelly of the American Dream. Fabiola Toussaint is a 16-year old girl traveling to America with her mother from Haiti to live with her aunt and cousins in Detroit. The dreams of an exciting new life quickly come to a halt, though, when her mother is detained by immigration authorities in New York, and Fabiola must continue onto Detroit by herself. Fabiola was born in America, so she is an American citizen, but her troubles are far from over in her new home. She moves in with her Aunt Jo and her three cousins, twins Princess (Pri) and Primadonna (Donna) and older sister Chantal. She likes her new cousins, makes a friend at her new school, and is even interested in a young man that she meets. But the more Fabiola learns about her new life in America, the more conflicted she is. It seems that the ideal American life she's dreamed of comes at a price, one that Fabiola isn't sure she wants to pay. Even as she struggles with these new issues, she never stops trying to find a way to be reunited with her mother. 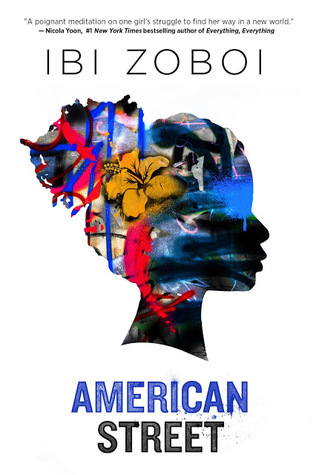 America Street is an engrossing story that had me hooked right from the start, and it was especially immersive on audio, with Fabiola's Haitian-accented voice (compliments of narrator Robin Miles) telling her story, sprinkled with words of Creole. The story here is complex and nuanced, focusing not only on Fabiola's immigrant experience but also on the challenges her American family faces in trying to earn a living, pay for education, and make a better life for themselves under the constraints that face many in poor, urban areas. The burdens they face and the decisions they have to make - including Fabiola who is new to all this - are shown in a way that makes it clear there are no easy answers. The novel also includes a thread of magical realism, which I don't always like, but you can take that as you wish - as magic or simply as Fabiola reading symbolism into people and events based on her voodoo upbringing. It didn't detract from the very real issues for me. I absolutely loved this powerful, thought-provoking novel and found myself rooting for Fabiola and her family. Or order American Street from Book Depository, with free shipping worldwide. I need to see if my library has the audiobook for American Street. I started it in print and set it aside. I disliked the cousins and aunt so much. ha ha - yeah, they aren't very likable at first, Anne, but the more you read, the more you understand what's behind their actions. I really enjoyed it on audio. I am so excited to read this book and can't wait until I am finished with the CYBILS finalists so that I can jump back into fiction! This would be a great one to get back into fiction with!